Every two seconds in America, someone — somewhere in the country — needs blood. Just one donation can save up to three lives. In AOC General Counsel, two employees are making a difference and doing their part to help. 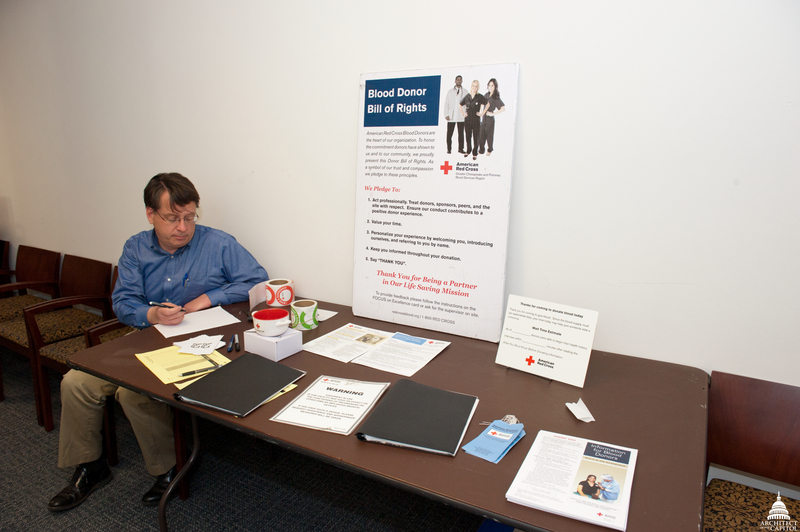 For almost 40 years, Deputy General Counsel Kevin Mulshine (pictured above) has been a blood donor. He started giving blood in 1973 when he was a Capitol Hill intern for a Member of the House of Representatives. "Giving blood is something you can spare if you are otherwise healthy — it is something you can literally give of yourself," Kevin says. Every few months at the American Red Cross E Street Donor Center in Washington, D.C., Kevin undergoes a process called platelet donation. The process takes Kevin's blood from one arm and then passes the blood — about a fourth of a pint at a time — through a sophisticated cell-separating machine. The platelets are collected by the machine, which then safely returns all remaining blood components back into Kevin's other arm. Since the process takes longer than a traditional whole blood donation, Kevin often passes the time by watching movies or TV episodes on a portable video player. Many physicians often prefer donations such as this because one single platelet donation can be worth 12 to 18 whole blood donations. Recipients of these donations are often patients undergoing chemotherapy or organ transplants and therefore have weakened immune systems. When General Counsel Secretary Gloria Grinder donates blood, she is often able to do so in the Ford House Office Building, where the Congressional Budget Office (CBO) and the Red Cross team up to host blood drives. "It's nice to be able to donate in the same building where you work," says Gloria. A Red Cross volunteer works at the blood drive sign-in table in the Ford Building. Prior to joining the AOC in 1990, Gloria worked for 10 years as a licensed practical nurse on a medical surgical floor. The job was very physically demanding and when Gloria felt she needed a career change, she opted to work for the federal government. "My experience as a nurse definitely played a part in wanting to be a blood donor," says Gloria. "It's a small thing you can do to help others." While most people can be blood donors, only five percent of the eligible population actually donates — making Kevin and Gloria true heroes, even if they don't consider their efforts extraordinary. For those who might be squeamish about the process, Gloria explains: "For me, it's never been painful and has always been very easy." Gloria adds that she always encourages first-time donors to eat well a few days before and after they donate blood — especially to increase their intake of iron-rich foods — and to drink lots of fluids afterwards. "If I ever needed blood, I'd feel good knowing that other people did the same thing to help me," says Gloria. Adds Kevin, "You don't know who will receive it, but you know it will go to someone who needs it — and that's a good feeling."